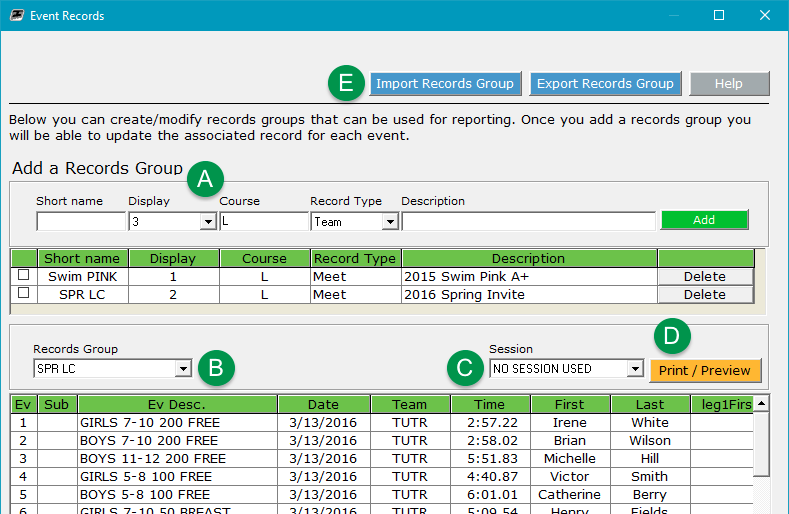 TouchPad can use unlimited records groups in a meet, where each records group has a top time for each event in the current meet. The process is as follows. If you have a records group used in prior meets, import it. After the meet is finished, print a Records Broken report (in Meet Results screen) to see which records swimmers have broken in this meet. Use that report to update those records on this screen. Export the records group for use in future meets. Pull up the Event Records screen by clicking the Events menu, then clicking the Event Records button in the upper right. Fill in the fields under Add a Records Group, then click Add. You will then see a row where you can enter a record for each event in the grid below. Short Name — The name used to identify the records group that will appear on the Records Broken report. Display — The order in which the group appears in the dropdown selector below. Course — Y for SCY, L for LCM, or S for SCM. This is read-only and automatically set based on the course type of the current meet. Record Type — Designates the scope of the records group. It has no effect other than informational. Description — A more detailed name for the group. Check one or more boxes, then click Export Records Group to save the selected group(s) to use in other meets or share with others. Click Delete in any row to delete that records group. Note it only deletes the group in the current meet; it does not delete it in other TouchPad meet nor any exported files. You may edit the following fields in any records group row: Short Name, Record Type, Description. Select which records group to edit in the dropdown, then edit the records for each event in the lower grid. If there is no record for a certain event, leave the row blank. Ev, Sub, Ev Desc — Taken from the current meet; these are read-only fields. Date — When the previous records was achieved. Team — Typically the club code of the team the athlete was in who achieved the record. Time — Enter the time achieved without punctuation, such as 12345 for 1:23.45, or 4200 for 0:42.00. First, Last — First and last name of the athlete who achieved the record. Leave blank for relays. leg1First, leg1Last — First and last name of the athlete in the 1st leg of a relay. Leave blank for individual events. leg2First, leg2Last...leg4Last — First and last names of the athletes in the 2nd, 3rd and 4th legs of relays. Create a report of all the records in the currently selected records group. Import Records Group — You may import a single records group using the old tab delimited text file format from prior versions of TouchPad, or a new records group XML file that can contain one or more records group. Export Records Group — Select one or more records group in the upper grid, then click Export Records Group and name the file. This file can then be imported into another TouchPad meet, even by other teams. See Import/export records for more info.